I was a bit young for Marc Bolan. I was aware of him and some of his songs and I definitely remember when he died – this new musical, a biography, brought all that back. You can’t deny the nostalgic appeal of shows of this type and I think some members of the audience were expecting a tribute act rather than an actual drama. Bolan’s story is framed around the device of his son, “Rolan Bolan” (Luke Bailey) now grown-up and hungry to learn about his famous father. Mum, Gloria Jones (Donna Hines) is tired of his probing and sends him off to London (or “London, England” as she calls it) so he can find out for himself. Rolan rocks up at his gran’s place, in Walford it sounds like, and meets both Gran (Sue Jenkins in Catherine Tate mode) and Uncle Harry (Pete Manchester) and as they pore over the family album, young Marc appears in school uniform and Davy Crockett hat, his main preoccupation before rock and roll took hold of his imagination. We see teenage Marc with a D.A. giving Helen Shapiro (a splendid Katia Sartini) the elbow because she gets a record contract before he does. A succession of wigs brings us to the familiar corkscrew mop of hair that was his trademark. It’s the stuff of bio-pics: the rise of the single-minded artist, although Bolan is depicted as a bit of a drip. The show seems to poke gentle fun at him, or rather this version of him that fits the mould of this type of story. The script is humorous but it’s the music that keeps the piece alive and kicking. The hits keep coming: Metal Guru, Ride A White Swan, Jeepster... and you realise what a rich back catalogue T.Rex had. The change of eras and fashions is marked by the energetic choreography by director Gary Lloyd. There is a shortage of drama. The bitterness and resentment of Bolan’s mother towards Bolan’s widow, who was driving the car in which he was killed, is emphasised, but during Bolan’s life, there seems to be very little conflict. He argues with producer Tony Visconti (an excellent Andy Coxon) about shortening the name of the band, and capitulates after half a minute. He argues again about having strings in the arrangement of a new song, and again, thirty seconds later, gives in. It makes Bolan seem petulant and silly, rather than egotistic. With that wig it’s like Dennis the Menace having a strop. We know it wasn’t Bolan’s ego or lifestyle that brought about his premature demise. We know there’s an encounter with a tree in his near future. Rolan contrives to get his mum and his gran at the accident site for a reconciliation to bring closure to the story – it’s a bit hard to stomach, whether that moment happened in reality or not. Sue Jenkins is a formidable stage presence and Donna Hines’s rich singing voice is marvellous to hear. I also enjoyed Matthew Ashcroft as two of Bolan’s collaborators, Steve Took and Mickey Finn. 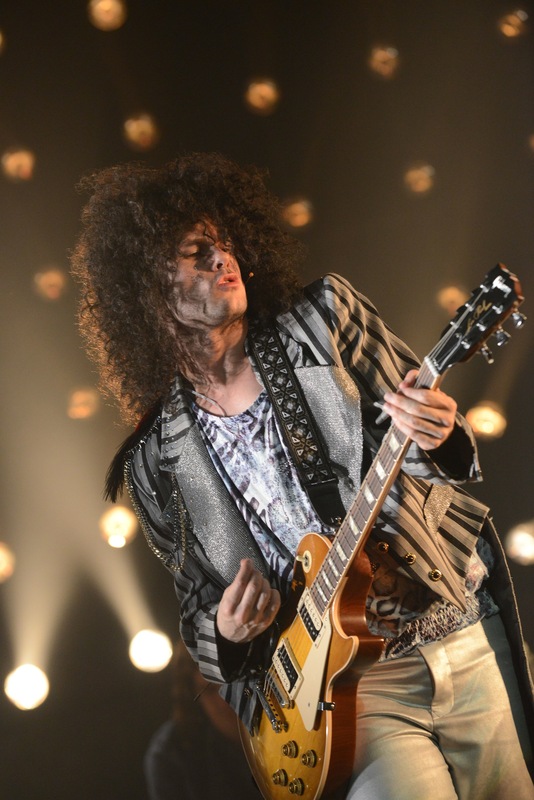 At the heart of the show is an electric performance from Warren Sollars as Bolan, who gets the singing and the posturing spot on. Despite the script’s shortcomings, the show is ultimately a celebration of a life and a glorious opportunity to be reacquainted with some of the best music of the 1970s.